If you’ve ready any of my past holiday craft posts, you will know that I love making wreaths. I have a wreath for every season and every holiday. 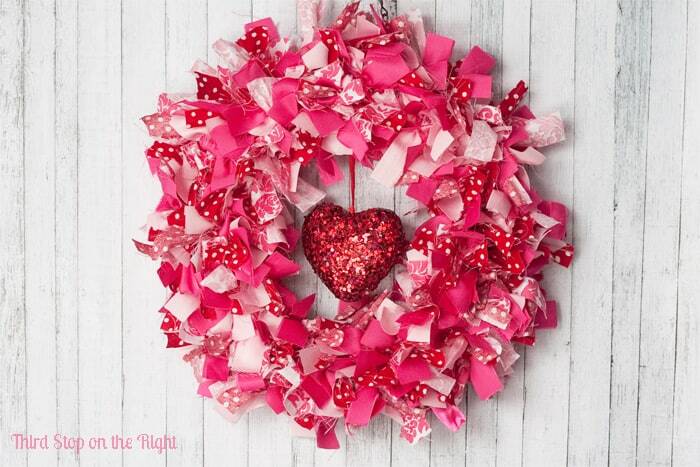 This year, I decided to make a Valentine’s Day rag wreath. 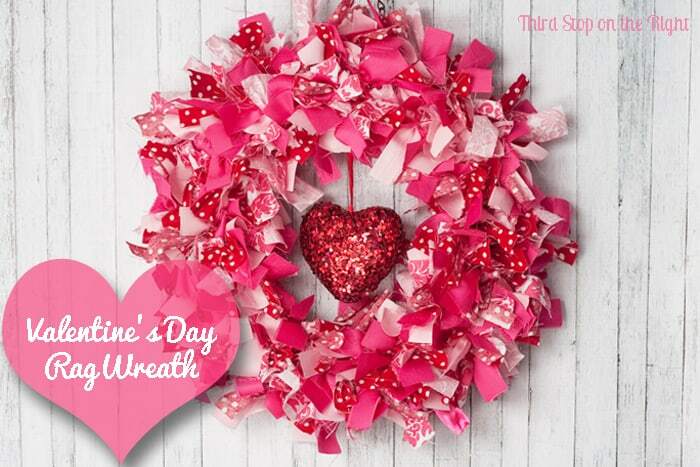 The awesome thing about these wreaths is that not only are they super easy to make, but they are inexpensive too. In addition, you may even have the materials already laying around the house to make one. 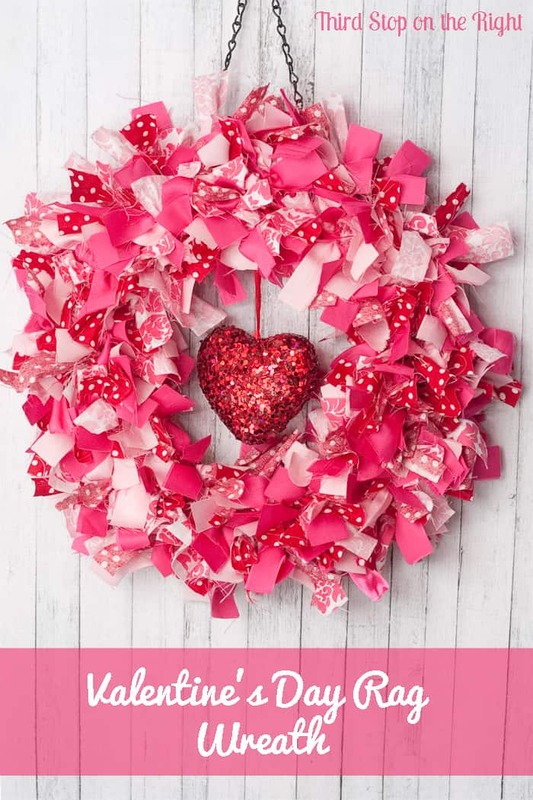 If you love this wreath as much as I do, then I will show you a quick tutorial on how to make it. I picked up the wire wreath frame at Joann Fabrics for only a few dollars. I chose a 12″ wreath, but you can always go bigger or smaller. You will just have to cut a little more or a little less fabric. I’m planning on using this on an inside wall, so I didn’t need something huge. I found the decorative heart at Michaels, but obviously you can use whatever decoration you want. Now, for this project I used four certain kinds of fabric. Two of these fabrics I had left over from another project and the other two I bought specifically for this project. If you do choose to buy fabric I suggest checking out the remnant section at the fabric store first. You don’t need a lot of fabric and you can usually get these remnants for a deep discount, so if they have any reds, pinks, or whites that you like it will save you a lot of money. If you do choose to have fabric cut, you won’t need more than a yard. 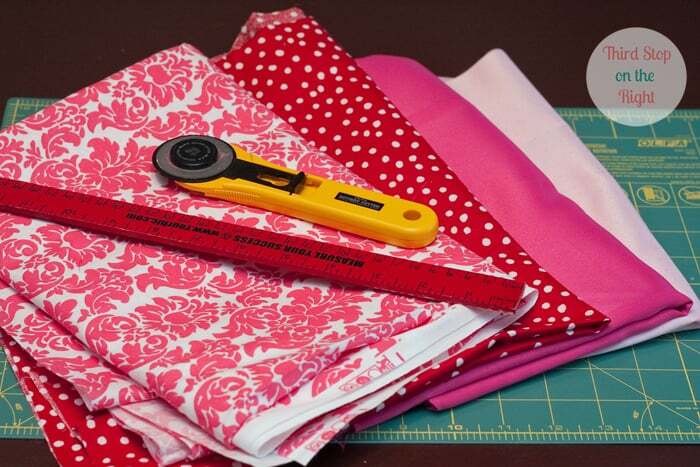 Use your rotary cutter to cut the fabric into strips that are approximately 1″ tall and about 5 to 6″ long. You are going to need about 400 strips for this project, so using the rotary cutter will make the process go so much faster. 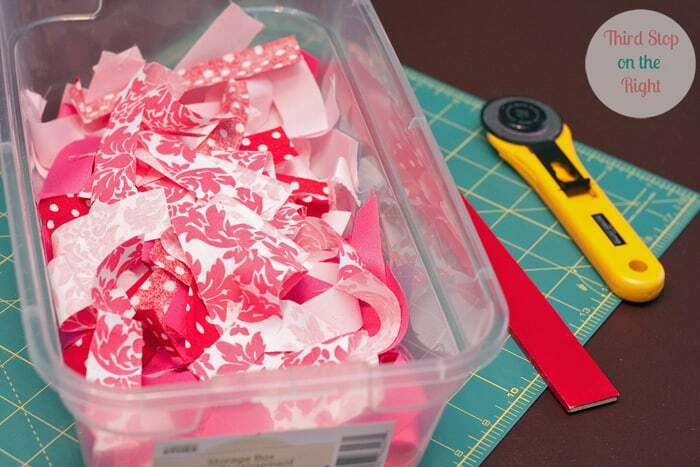 You can use regular scissors, but unless you have a gazillion hours to kill, the cutter is a much better option. I also suggest cutting all of the fabric first and then start tying. It makes it easier if you are wanting to alternate fabrics or create some sort of a pattern. If you are OK with more of a hodgepodge look or trying to fill in the pattern later, that’s OK too. Its just that it gets hard to tie the knots as the wreath gets fuller. Then, you just want to start tying knots. A regular knot is fine as long as you pull the knot tight. A double knot isn’t necessary. Another thing to note is when you are trying knots, keep the wreath face up. 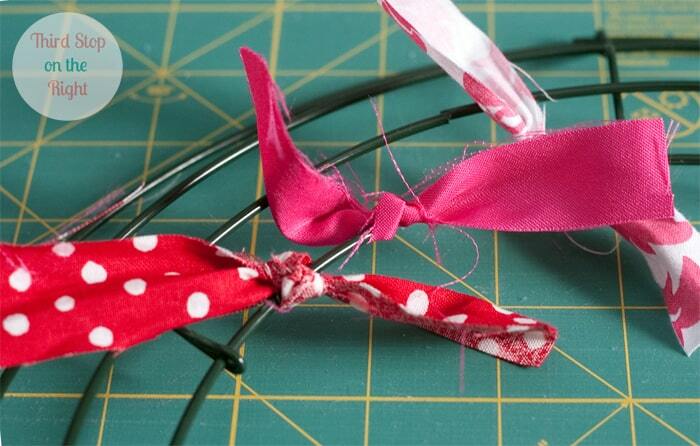 This will keep both ends of the fabric strip on the front side of the wreath and will keep it looking fuller. Now, all you have to do is tie. The best thing about this is that it can be done anywhere. All you need is your box of strips and the wreath frame. You can tie while sitting on the couch watching TV, or even in the car on a road trip. How many strips you use on the frame is up to you. I like a fuller look so I used more fabric strips, closer together. You could use fewer strips spaced further apart for a looser look. 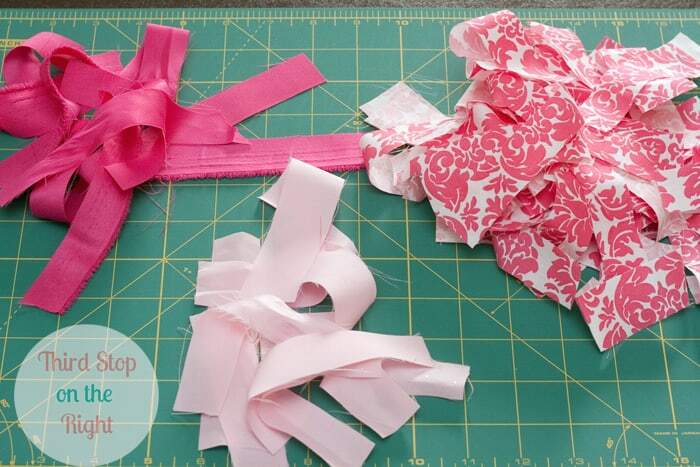 When you are done tying the knots in all of the fabric strips, then it is time to add any embellishments (if you want). I chose the sparkly heart, which already had a string, but you can use anything you want. I tied the string of the heart into the back of the wreath frame so it hung down in the middle. If the embellishment you choose doesn’t have a string, you can always attach it to the wreath frame using wire or even hot glue. I also added a small section of chain to the wreath in order to hang it on the wall. This is optional though. If you do want to add the chain, you can purchase a small section of it at either Home Depot or Lowes. If you don’t want the chain, all you have to do is hang the wire frame over a nail in the wall. I think this wreath really gives out living room a festive mood. I am looking forward to making more of these wreaths for different occasions! Do you love this project as much as I did? If so, please share on Pinterest! This is very pretty. Perfect for upcoming Valentine’s Day! Hi, Rachel! I love your wreath! I used it for inspiration for a wreath I made and shared on Mom Home Guide! Thanks for sharing!